Walk into a typical visitor center, and consider what you see. A nondescript room with some photos on the wall, an aging map, a rack of randomly organized pamphlets, a small staff on-hand to answer questions and perhaps takeaway guides listing local businesses. While this arrangement provides basic information, it does little to get visitors excited about the adventures available to them or sell them on the unique experiences awaiting them when they visit local businesses. In the case of Montérégie Tourism center, officials realized this traditional approach was doing a particular disservice to the region. Conveniently located south of the Island of Montréal, midway between the cities of Québec and Ottawa, the Montérégie is a vast region of mountains, hills, valleys, rivers and lakes offering picturesque views, with a unique blend of culture, agriculture and heritage. In fact, the region gets its name from the abundance of Monteregian hills that define the area. Montérégie’s rich soil makes it an ideal location for the many orchards and vineyards dotting the region. In-season visitors can pick their own fruit, and winemakers often offer samples of their creations. While in the Montérégie region, visitors can also stop at its many museums and historical sites. Montérégie is also home to a number of shops, restaurants and museums, and hosts events and festivals throughout the year, attracting visitors from all over. Overseeing the efforts to drive visitors to these various activities is Montérégie Tourism. Established in 1978, Montérégie Tourism is one of 20 regional tourism associations in Quebec. The mission of this non-profit organization is to promote tourism in the region by coordinating publicity, promotion and commercial activities. Local businesses make up the membership of the association. From its beginning, Montérégie Tourism had established several small, plain offices to make information available at various points throughout the region. But in 2006, the board came to realize the association could do more. Rather than simply inform, they wanted to entertain, entice and excite visitors about the region. Their vision was to create a visitor center that delivered such a unique experience that those who came would want to fit in as much as they could and make plans to return to do even more. In other words, they wanted to create a “wow” factor. 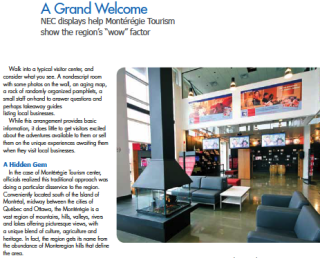 Montérégie Tourism’s vision for their visitor center was unprecedented. There was no template to follow and there were no proven ideas to adapt. The opportunity to create this new visitor center concept came with the creation of a new “power center” in Brossard across the river from Montréal. Similar to a lifestyle center, the new complex would incorporate both large stores and boutiques, hotels, restaurants and other buildings. It seemed like the perfect location to create a gateway for tourists who wanted to explore what was available in the region, outside of the major cities. Montérégie Tourism secured a high-visibility location within the power center that offered a view of the highway and was just two minutes from the bridge connecting it to Montréal. Then came the task of designing the new visitor center. Montérégie Tourism expected plenty of visitors at the new facility, which was part of the reason they wanted to incorporate video into the design. Today, Fournier says, consumers are used to seeing video everywhere they go. Whether it’s on their laptop or tablet computers, their smartphones, a digital sign in a store or hotel or some other medium, video is a part of their daily lives. Montérégie Tourism felt it would be a good way to capture visitors’ attention and keep in touch with what they want. The interior is divided into eight tourist zones, each covering a different aspect of the region, such as cycling and wine tasting. The flow of traffic is designed to carry visitors from one zone to the next, with each zone creating a unique experience without conflicting with the others. The visitor center also includes a boutique where visitors can purchase cider, wine and other products along with gift certificates for the region. Typically, the design process for a building such as this begins with the architects, who create the concepts and receive approval. It is then up to the integrators and other partners to determine how to fit video hardware and software into the approved design. In this case, however, the architect involved the video producers, Arsenal Media and integrator Genesis Integration Inc. from the beginning. That proved to be an important decision. Once the team had an idea of where they wanted the screens, it was time to decide which screens to use. For Montérégie Tourism, Arsenal Media and Genesis Integration, that was one of the easier solutions. Genesis Integration recommended the use of NEC Display Solutions screens throughout the visitor center. A total of 23 screens were specified, from small 23-inch screens for use in interactive information kiosks to large 52-inch HD displays that are spread across the eight tourist zones. One of the features all three organizations liked was the built-in scheduler that allows Montérégie Tourism to adjust its programming as needed. Seasonal videos can be added and deleted easily, and the timing is quickly changed if necessary to match traffic flow. Having commercial products with a three-year warranty (versus consumer products with a one-year warranty) was also comforting to Montérégie Tourism. On the large-screen displays, the thin bezels of the NEC P Series enhance the visitor experience by improving the aesthetics of the overall installation. NEC’s customer service also played a part in its selection. Once general construction was completed, Genesis Integration installed the screens, and Arsenal Media began loading content. Among the videos developed are a capsule history of the region, long and short promotional videos, a discovery video, one focusing on products of the region and more. All of the work went smoothly and was completed in February 2011. That left two months for training the staff and getting ready for the launch in May. Each of the zones includes an interactive information kiosk that visitors can use to obtain more information about different activities and places to visit. The touchscreens allow them to select an area of interest and then drill down to obtain more information. For example, in the history zone, visitors can find information about museums, battlefields and other historical sites. Currently, Montérégie Tourism is receiving a few thousand visitors per month. Once construction is completed at the power center in 2012, Fournier expects that number to go up to 100,000 visitors a year. Future plans call for adding 15 NEC displays in the hotel, the power center and other high-traffic areas, which is expected to drive even more traffic to the Montérégie Tourism visitor center. One of the more exciting developments in recent months have been the visits from tourist groups in other provinces of Canada, as well as France, to see what Montérégie Tourism has done.